When we heard about this years ‘Blue Light for Temple Street’ we thought it was sounded like a perfect event to get involved in considering our relationships with the emergency services. The day involves staff and vehicles from An Gardai, the Defence Forces, Dublin Fire Brigade, the Ambulance Service and Civil Defence exhibiting their services on the day. The aim of the event is to attract families and children attending Temple Street and local residents and those passing by to the event to visit and learn more about these important services. At Esmark Finch we have worked with different departments for the emergency services and have such respect for all their hard work. 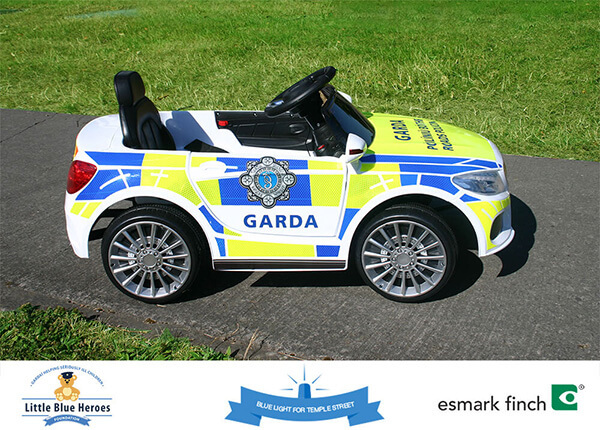 We contacted Little Blue Heroes, a charity which Garda help seriously ill children. Little Blue Heroes were heavily involved in this event and we reached out to them with our idea. We recently worked on the rebrand of the Garda Traffic Corps to Garda Roads Policing. 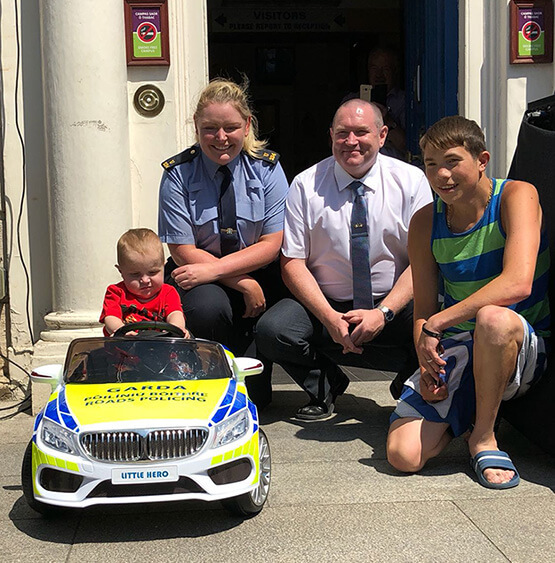 Our plan for ‘Blue Light For Temple Street’ was to convert a kids 12V electric ride-on-car to a mini roads policing vehicle. As well as impressive High Visibility Garda branding, the car has amazing features such as MP3 Input, Working Lights, Parental Remote and Horn and Turn Sounds. 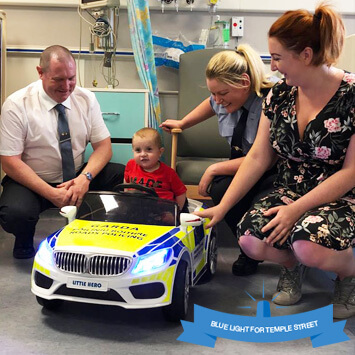 The mini roads policing car would be won by a patient in Temple Street, making one deserving little hero’s day a bit brighter. We worked with Blue Little Heroes to design entry forms and box for entering the competition which were passed around the hospital. It was a beautiful sunny day for ‘Blue Light for Temple Street’ with the emergency services looking fantastic on display. Even some of the vehicles Esmark Finch worked on were in attendance. The mini roads policing car was doing the rounds, with kids enjoying taking it for a spin. Once all the forms were collected we selected the winner to an excited crowd. We were delighted that Martin, a patient at Temple Street was the lucky winner. Well done to everyone who organised this fantastic event and we are so grateful to be involved.